Mulberry Endura™ 1-Gang Medium size blank wallplate in white color, features rugged thermoplastic construction. 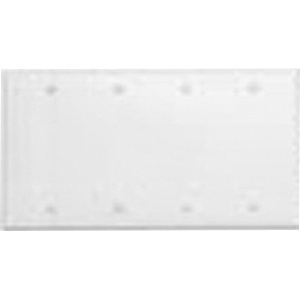 Rectangle wallplate measures 3.25-Inch x 5.06-Inch x 0.70-Inch. The 3.281-Inch box mountable wallplate is suitable for hospitals, schools and other institutional facilities. Blank wallplate is UL listed and CSA/NEC certified.